Carrickfergus Enterprise has hosted its annual ‘Celebration of Enterprise’ with a large number of businesses in attendance. 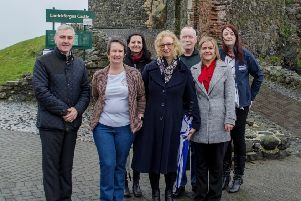 Many of those present had accessed support through the Business Improvement Programme, funded by the former Carrickfergus Borough Council. Cameoflage aka Gregg Davidson surprised guests by arriving mid-way through the evening dressed as a PSNI officer to announce there was a problem with the security alarm, only to burst into song and entertain them.